Texting videos is a high-converting method for following up with prospects. However, it needs to be done correctly. Texting a cold prospect as a first touch is not advisable. According to recent statistics, while texting in the sales process can lead to conversion gains of more than 100%; sending text messages before establishing contact with a prospect can adversely affect both contact and conversion rates. (Source: Velocify). The reason is that people want to give their permission first to contact them. Texting is more of a personal connection than email. Thus, texting videos to cold leads transmits that it’s all about you, and not them. Once you establish your first connection and follow-up with a video text message, text messages have an incredible 98% open rate and a 45% response rate. While sending text messages in general achieves these statistics, using personalized video messages can help to quickly build trust and authority with your prospects - something that is difficult with standard text messages. With Vaetas Connect, our follow up video text messages, as well as follow up emails increased the conversions to 99% when the messaging was correct. The free Vaetas Connect actionable “Video Recording Toolkit” demonstrates how to create high converting video messages without needing to write or read a script. It helps you to sound more natural and your message connects with your viewers. This is because your message is all about them and not you. 44% of consumers would rather receive product details and other marketing messages through text over any other channel. (Source: Direct Marketing Association) Video is the best content for product details. Having an easy-to-use texting app that sends personalized videos can increase both your viewer’s engagement, and conversions. 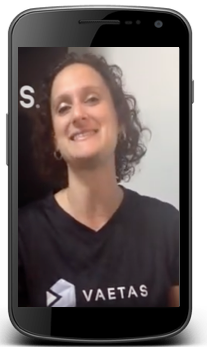 With texting currently being a hot channel for people, and video being the content of choice, you can create an exceptional follow-up texting videos campaign strategy. It doesn’t matter whether you use an Android or iPhone smartphone. You can begin texting videos from Android to iPhone and visa-versa. However, it’s important to understand that there are two parts to using video for your prospecting and follow-up campaigns – viewer engagement and conversions. Increased viewer engagement is accomplished when your personalized message is “all about” the viewer and how you can help them. Sending a message that is “all about you” rarely converts. Good viewer engagement determines the response rate. Conversions are when the viewer takes your next desired action step to respond. This can be cumbersome for most texting apps that send videos. They do a good job of sending your video text messages, however they usually require viewers to go to a landing page to watch the video. Some will place a call-to-action button on the page. However, when the video opens to play, the viewer has to close it to get back to the page. Using the Vaetas Mobile App, you can send your call-to-action videos as text messages. 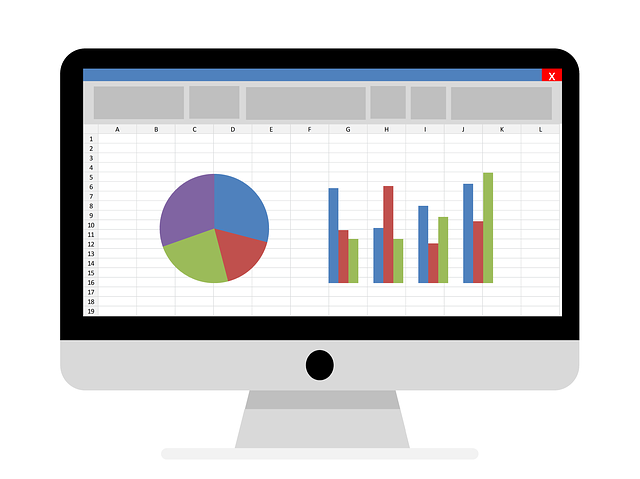 You also have a fully-integrated Web app. In addition to texting, your call-to-action videos can be sent by email, as well as direct social messaging. The apps are fully integrated as an easy-to-use call-to-action video communication system. With Vaetas Connect, high converting calls-to-action are a part of your video and they are not required to be embedded in a landing page. Your videos play full-screen and your viewers can take the next action step that YOU choose. YOU have the power to control your viewer’s next action step to contact you directly from your video. 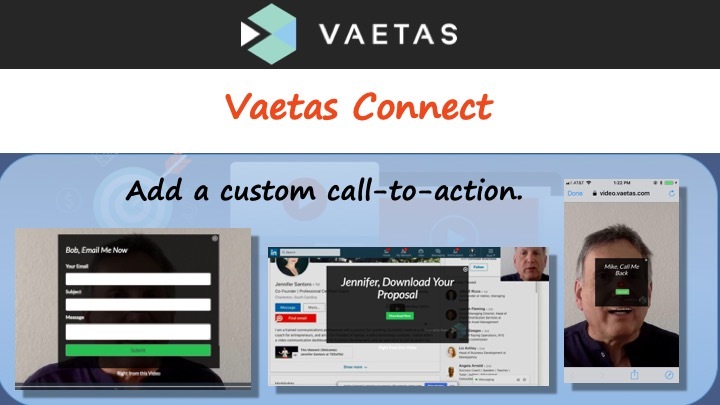 With Vaetas Connect, full-screen videos maximize your viewer’s engagement and custom calls-to-action allows them to immediately respond without having to take extra steps. Texting videos has never been easier. You can obtain a 15-Day Free no obligation trial to Vaetas Connect. You can unsubscribe at any time from the Vaetas Web app dashboard and you won’t be charged. We look forward to helping you build your business when you become a member of our growing Vaetas community. Copyright 2019 by Vaetas, LLC.